Birthday Bash! 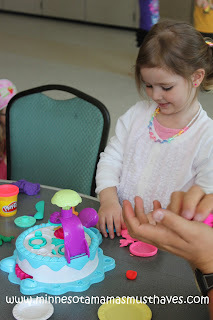 Play-Doh Review & Giveaway! Not only is Play-Doh a perfect Birthday gift idea but it is also a perfect Birthday party activity! 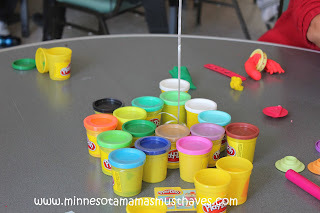 One thing that has become a big hit at our kids’ Birthday parties and has now come to be expected is a Play-Doh table. Everyone loves coming and playing with Play-Doh and even the teens and adults join in on the fun. Who can resist a little Play-Doh fun? 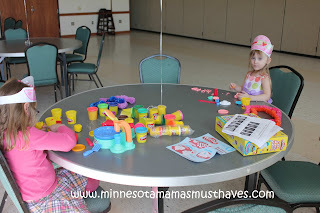 This party was no different and of course we had a fun Play-Doh table set up with new Play-Doh sets. We like to get new sets for each party so they are new and exciting. This time we chose the Play-Doh Cake Makin’ Station set and the Play-Doh Flip ‘N Serve Breakfast set. 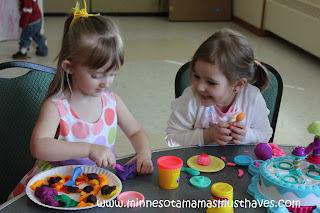 They had a blast with the Play-Doh sets and I just love that this is an activity that three year olds can do on their own while the adults at the party visit. It kept them entertained for hours. 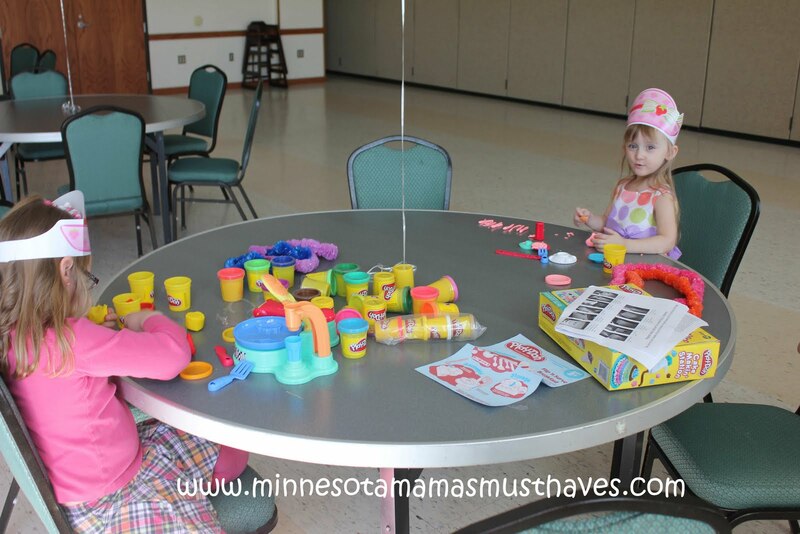 This picture is of Danika and her cousin playing Play-Doh before all the other guests arrived. It also works as great entertainment while you are busy setting up and decorating! Why we love it: Play-Doh is one of those classic toys that never goes out of style and has no age limit. It kept the kids entertained for hours during the party and is now a staple at all of our parties! Suggestions for improvement: None, we love Play-Doh! Buy It! You can buy Play-Doh at a retailer near you! You can also check out the Play-Doh site and buy it online. Win! One reader will win the Flip ‘N Serve Breakfast Set! Visit Play-Doh and tell me another set you’d like to own. *Remember to include your email address in your comment if it is not visible on your profile or you will be disqualified. After you have completed the above mandatory entry you are eligible for additional entries. If you are unfamiliar with how to do this please see my post here. Remember to leave a separate comment for each additional entry and include your email address in at least one entry. Each bullet is one entry unless otherwise stated. Subscribe to Minnesota Mama’s Must Haves by Email (not feed)-remember to activate your subscription! Current subscribers count too. Follow my blog publicly-Current followers count too! Enter any of my other giveaways– Leave a comment saying which giveaway you entered-you may leave a separate comment for each extra giveaway you enter-LIMIT 5 extra entries-this means you enter 5 different giveaways and comment on each one you entered up to 5 max entries. If you blogged about the Birthday Bash event before it started and left me a comment on that post then take your 5 extra entries! If you grabbed the Birthday Bash event button before the event started and left a comment on that post then take your 5 extra entries! Leave the URL where you Tweeted. 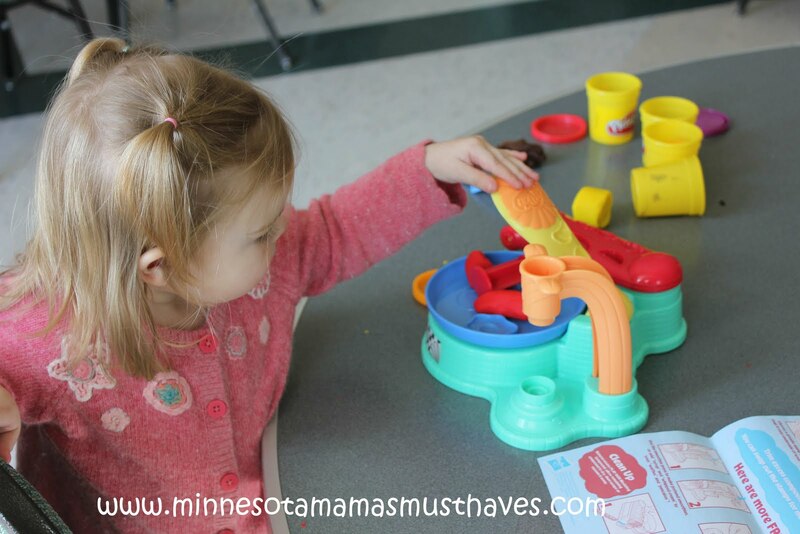 Like Minnesota Mama’s Must Haves on Facebook-leave your facebook name with your comment. One extra entry for each place you list it. Leave a relevant comment on any non-giveaway post (review only posts are great). One entry per comment left. Open to Continental US only, non-PO box. Giveaway ends May 2nd at 11:59pm. Winner will be drawn by random.org and announced on this blog as well as emailed. Products reviewed were provided to me free of charge. No compensation was given in exchange for this review. My opinion is my own and is an honest view of my experience with the product. Winner will have 48 hours to respond or a new winner will be drawn. Email address must be in at least one comment or visible on your profile to win. Good Luck! Teacup Piglets Review & Giveaway! The Struggles of Breastfeeding and the Big Rewards That Follow! Birthday Bash! Mini Lalaloopsy Ferris Wheel Set Review & Giveaway! Birthday Bash! Princess Linens Doodlebag Review & Giveaway! « Karmin G3 Salon Pro Hair Straightener Giveaway! My son would love the PLAY-DOH Cookie Monster's Letter Lunch Playset. He is obsessed with Cookie Monster! I'd love the have the cake making station set. I love love love playdough sets! I think my son would like the PLAY-DOH Burger Builder Playset. I entered the Chuggington Railway giveaway. I entered the Melissa and Doug Play Food sets giveaway. I entered the Wilton Giant Cupcake pan & Long Loaf Pan giveaway. I entered the Safe Sippy giveaway. I entered the Birthday Express giveaway. I like the octopus playset. I love the coco monkey set. My son has asked me for the Mega Fun Factory Playset before. It looks like a fun one! I would also love to get the PLAY-DOH Magic Ice Cream Swirl Shoppe for my kids. Kenna would love the super caddy craft set! The PLAY-DOH SESAME STREET SHAPE & SPIN ELMO Playset is really cute, thanks so much for the chance! The PLAY-DOH COCO-NUTTY MONKEY Playset looks like fun! 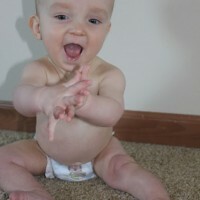 I subscribe to Minnesota Mama's Must Haves by Email! I entered your Melissa & Doug giveaway! I entered your Peapod Creations giveaway! I entered your Safe Sippy Cups giveaway! I entered your Chic Crossover Nursing Top giveaway! My son would love the Magic Swirl Ice Cream Shoppe. We would love the breakfast set. I Like the Play-Doh Spahetti Factory! I entered $75 Gift Basket! I entered Tyson Grilled Chicken! I entered Melissa & Doug! My granddaughter would like the PLAY-DOH Burger Builder Playset. I also like the Octopus playset. 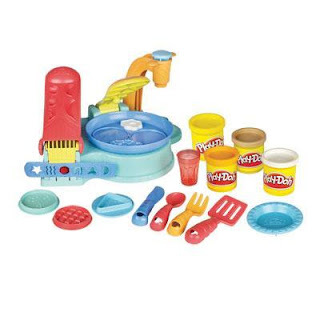 I'd love to own the PLAY-DOH CAKE MAKIN' STATION Playset. I entered the Teacup Piglets giveaway. I entered the Earth Crunch Mama giveaway. I entered the Wilton Giant Cupcake Pan giveaway. I entered the Safe Sippy 2 giveaway. the cake making station is cute too! The Magic Swirl Ice Cream shoppe looks neat. Magic Swirl Ice Cream Shoppe! Would like to own the PLAY-DOH Burger Builder Playset! Follow your blog publicly on GFC! Follow you on twitter (@r_shearn) and tweeted! I love the super crafty caddy! I like playdoh on FB! I'd love to own the PLAY-DOH MEGA FUN FACTORY Playset! I like the PLAYDOH MAGIC SWIRL Ice Cream Shoppe Playset. Entered Gift Basket & What To Expect the Second Year giveaway. Entered Safe Sippy 2 or Safe Sporter Sippy Cups giveaway. Entered Wilton Giant Cupcake Pan & Long Loaf Pan giveaway. Entered Teacup Piglets On the Go Playset giveaway. Entered Crayola Doodlebag from Princess Linens giveaway. The magic ice cream shoppe is too cute! I like the Magic Ice Cream Swirl. I like the PLAY-DOH Magic Ice Cream Swirl Shoppe! We would love the PLAY-DOH MEGA FUN FACTORY Playset! I would love the Burger Builder Playset. I'd love the PLAY-DOH Burger Builder Playset too. I entered your Karmin G3 Salon Pro Hair Straightener giveaway. I entered your Week 2 Scott Naturals Paper Products Prize Pack giveaway. I entered your ProFlowers.com giveaway. I entered your Lovable Labels Set of Return Address Labels giveaway. I entered your Little Tikes 2 in 1 Garden Cart & Wheelbarrow giveaway. I Like Minnesota Mama's Must Haves on Facebook (susan chew). like mmmh on facebook lisa w.
Would also love to have the PLAY-DOH CREATIONS 3D FLASH ART Playset. I would like the Octopus Playset…how fun!! I want PLAY-DOH DOGGY DOCTOR Playset for my little nephew. I'd like to get the PLAY-DOH Star Wars The Clone Wars R2-D2 Playset too 🙂 Are we nerds? Sure, but who cares?!?! My son would definitely LOVE the backyardigans pirate set!! My kids would love the PLAY-DOH MAGIC SWIRL Ice Cream Shoppe Playset. Liz would like the pizza making set. I entered your Zutano giveaway! I just found the PLAY-DOH MEGA FUN FACTORY Playset, I am going out to get this tonight! So cool! I like the Play Doh Octopus puzzle. I like Play Doh on FB (sarah smile).